Hi all! I’m hopping along today to celebrate my friend and fellow Ellen Hutson Design Team Ambassador extraordinaire Ardyth reaching 1K subscribers! Congratulations, Ardyth! YEAH!!! There are so many amazing stampers hopping along with us today — plus PRIZES — so let’s HOP to it! 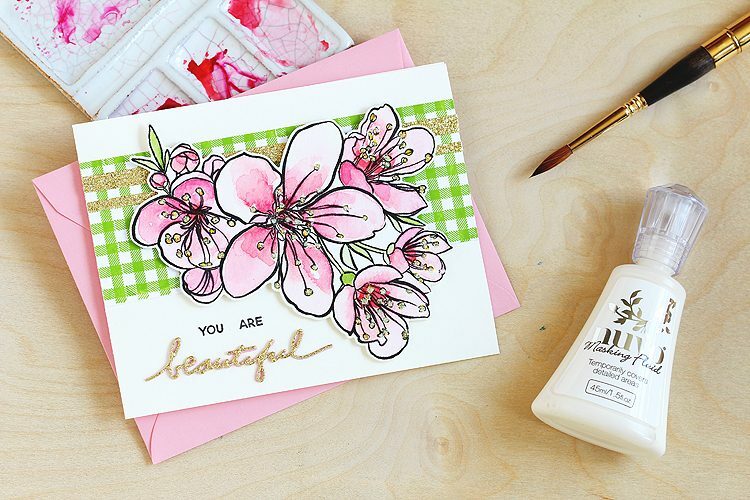 I’ve got a super quick video for you today sharing a new-to-me find: Nuvo Masking Fluid! This stuff is so cool you all! I’ve used regular masking fluid before that you apply with a brush — but this Nuvo Masking Fluid comes in an applicator bottle and it’s so handy. 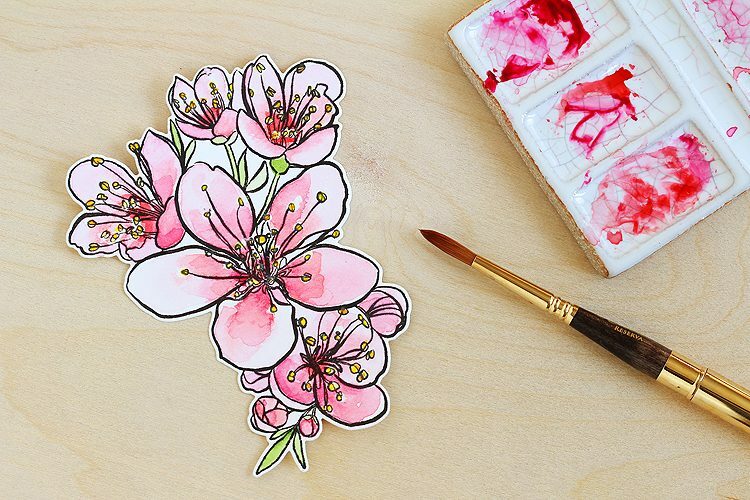 Easily add contrast to your project with Nuvo Masking Fluid such as highlights, edges, snow spots, and white lines and preserve areas of untouched paper with the precision nozzle that would be too tiny to work around. Apply to a clean dry surface and wait for the fluid to be thoroughly dry. 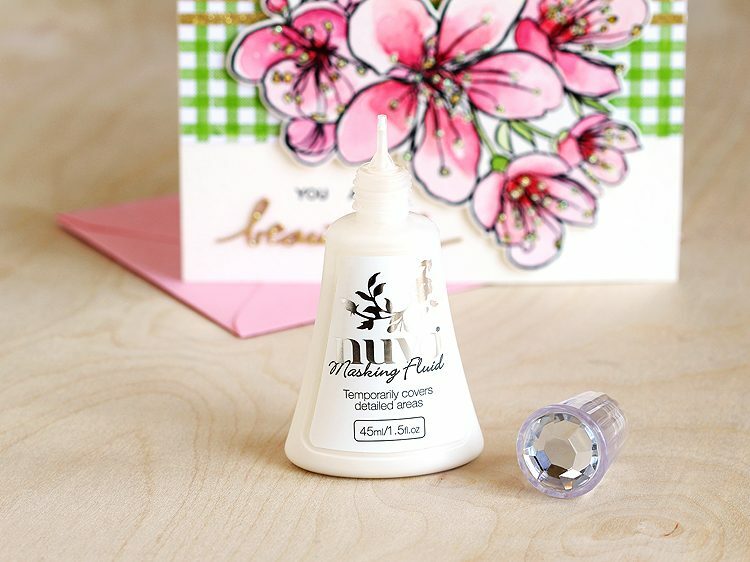 For use with a large variety of medium including inks and watercolors, simply remove the masking fluid from the paper with a soft eraser or gently rubbing with your fingertips to reveal an untouched pristine section! I can’t wait to try it on snowflakes! YES! 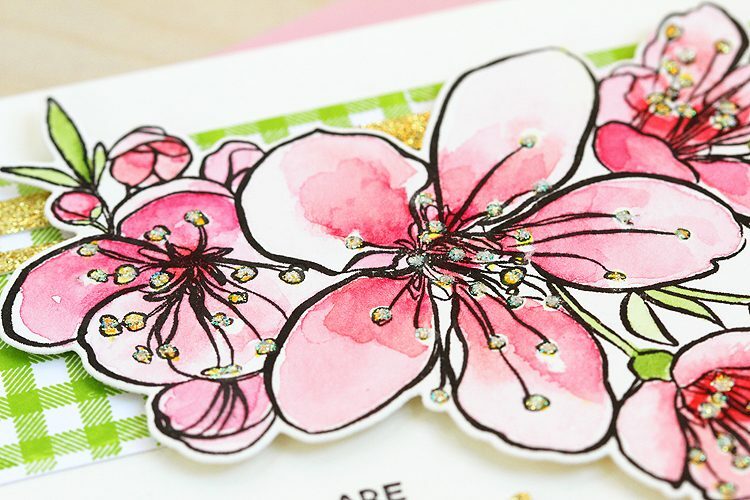 A few notes about the card — after die cutting the finished sakura with the matching dies it came together super fast! 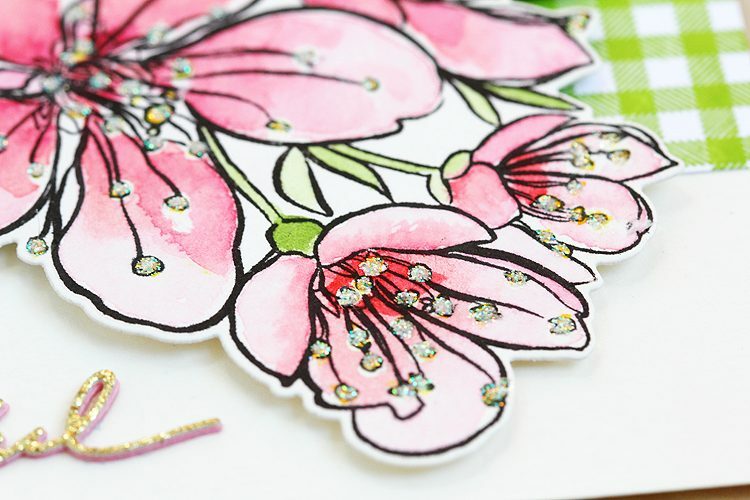 I was sitting at my desk thinking “you know, I wish I had some green gingham paper…” and then I remembered the new Essentials By Ellen Plaid Maker stamp set!! WOO! 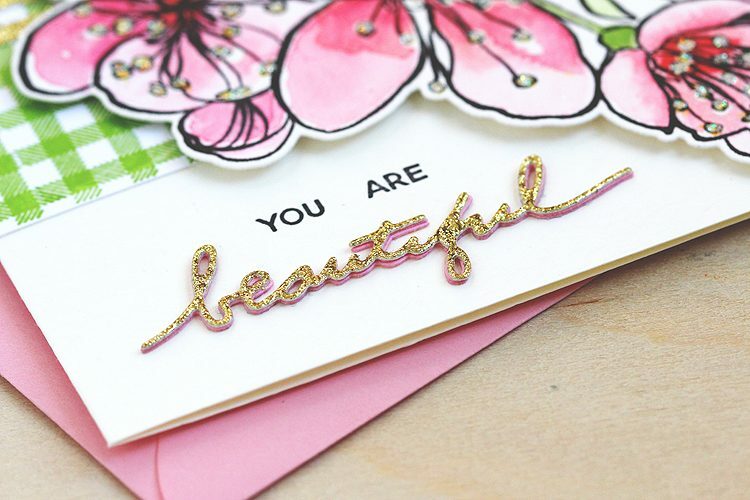 So I stamped that with lime rickey ink, then cut out the “beautiful” from glitter paper — also from the Mondo Sakura matching dies, stamped the “you are” and put it all together. And then! 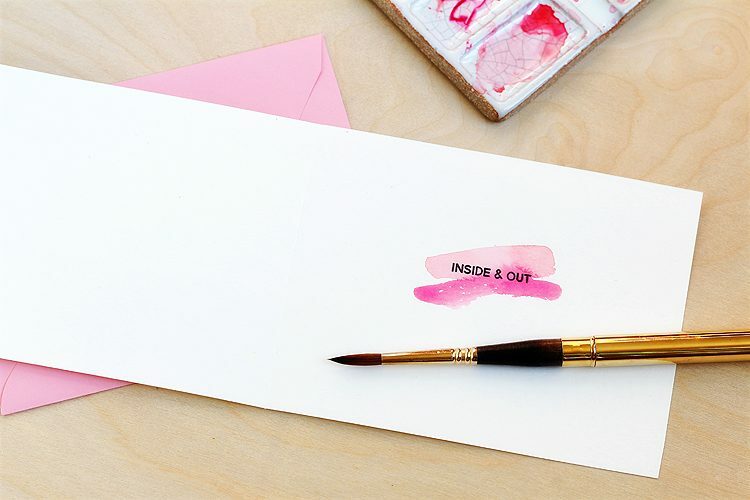 I just had to stamp that “inside & out” message on the inside of the card — love it when a card comes together this fast! These are my affiliate links, so if you make a purchase by clicking the link below I’ll receive a small commission at no charge to you — thank you! There are more than 20 participants on this video hop and there some amazing prizes up for grabs, so be sure to leave comments as you’re hopping along! One comment from each video on the hop will be chosen to win 2 Catherine Pooler inks of your choice. One comment from the whole hop will be chosen to win a $25 Gift Certificate to Ellen Hutson LLC. One comment from the whole hop will be chosen to win a prize pack valued at over $100 from A Jillian Vance Design. And because today is also Ardyth’s birthday, she’s contributing three $25 Gift Certificates (one to Ellen Hutson LLC, one to Catherine Pooler Designs and one to A Jillian Vance Design) to three randomly-chosen comment on her video on YouTube — because she’s awesome!! Thanks so much for joining us on the hop, and big huge mega congratulations to Ardyth!!! Yay!!! And happy birthday, too!!! Your next stop on the hop is Emily Midgett’s video here! If you encounter any broken links or want to start back at the beginning head over to Ardyth’s blog. Your watercoloring skills are excellent. I really enjoyed seeing this card/video. Oh, to paint that loosely. Beautiful. Absolutely beautiful card! I have this masking fluid but I’ve not used it yet. Thank you for the tips and tricks and awesome video. Lisa, such a pretty card! I really must try some masking!